Peter Parker wears blue and white striped pyjamas in bed. His favourite food is wheatcakes. His Uncle and Aunt call him “Petey”. Spider-Man’s mask is sewn into the shirt of the Spider-Man costume, like a hoodie. Spider-Man’s shoes have ridged soles, like running shoes or trainers. Peter Parker’s school is named Midtown High. It’s the sort of thing a villain might say; the sort of thing you hear in diaries and videos produced by school shootists. On the cover of the Amazing Fantasy #15, he sounds more like a super-villain than a new hero; more like Thor from Asgard than Petey from Queens. Publisher Martin Goodman hated this story: hated it so much he cancelled Amazing Fantasy, despite having given Spider-Man a great big build up. It’s not that Spider-Man is too skinny to be a hero, or that Aunt May treats him like a baby, or even that he has boringly un-heroic private problems. Anti-heroes are one thing: the Hulk is an anti-hero; the Sub-Mariner is an anti-hero; even Johnny Storm is an anti-hero at this stage. But but Ditko and Lee have made Spider-Man a dislikable character with no redeeming features. Peter Parker has a great home life, brilliant school grades, a guaranteed college place, and an excellent future ahead of him. But he spends the first half of the book whining. True, his friends don’t ask him to the dance; but he’s no Cinderella: they don’t ask him because he can’t dance, wouldn’t want to go and wouldn’t join in if he did. He actually cries (*SOB*) when Sally would rather go to the disco than attend an extra-curricula science lecture with him. That early Parker, with the monstrous Spider-ego bubbling up inside him, provided a terrible role-model for other anti-social nerds. It made more than one of us think that remarks like “there’s nothing wrong with being a dumb-head, you were just born that way” (Amazing Spider-Man #2) were clever things to say to the school football hero. But there’s an element of bully-enabling here too. Parker chooses to be an outsider: chooses to go to school in a jacket and tie while Flash Thompson is wearing a football shirt; advertises his book-worm status by carrying a pile of books around with him. (None of the other kids have taken their text books home. Can’t he even find a satchel?) Isn’t there a subliminal message here that if you are bullied, it’s probably your own fault? It may very well be that, if the Spider-Man graphic novel had continued, Steve and Stan would have shown how Parker grew into a reasonable human being. It is equally possible that the plan was for him to turn into a monster or a recluse. There’s another great story about a man who turns into an insect by another great Czech story teller. That one doesn’t end too well. That might have all worked well enough if Spider-Man had been a limited run feature in an oddball anthology comic. It wasn’t a great idea for Marvel’s planned move into the lucrative super-hero market. If you’d been in Martin Goodman’s shoes, you’d probably have killed Spider-Man after only one issue too. 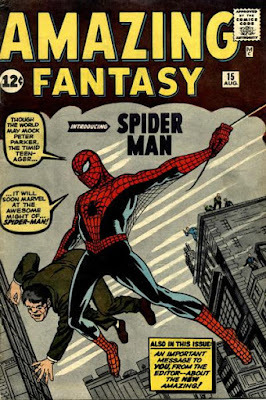 Amazing Fantasy #15 is a sacred text; a foundational document. If you are at all interested in comics, you have read it, many times. Even if you are not interested in comics, you know the basic plot, and the final line about responsibility and power. It’s the hardest thing in the world to pretend that it’s just an old comic book and sit down and read it. It’s a good story. It covers a lot of narrative ground; establishing Peter Parker; showing us the circumstances under which he acquired his amazing powers and how he misused them, in exactly twelve pages. The pacing is spot-on: page one starts with single-panel scenes (Ben dragging Peter out of bed; May giving him breakfast; the school science lesson) but the pace slows right down when we reach the museum. We get three whole panels of the spider getting irradiated and the fight with the wrestler lasts a whole page. There is a tremendous sense of place. This isn’t a New York of skyscrapers, but one of chimney pots, back streets, waterfronts and old acme buildings. Everyone has their own face and their own voice; even the policeman who calls out to Spider-Man and the little boy who accidentally sees him climbing up a wall. It’s split into two fairly self-contained parts; it’s quite possible to imagine them split over two issues, as may have been the original plan. Part 1 starts with Parker the outsider, and ends with Spider-Man hanging from the ceiling of his bedroom, with a wrestling match as a centerpiece. Part 2 begins with Spider-Man as a successful TV star, ends with him walking off into the distance, a broken man. It has the fight with the burglar as a centerpiece. Both halves are character pieces rather than action adventures (which was a good fit to "the magazine that respects your intelligence"). In neither fight is Spider-Man in the slightest danger. It really is a beautifully constructed moment. No sooner have we seen Peter Parker being incredibly petty and selfish towards the policeman than we see Ben and May being incredibly thoughtful and generous to him: buying him a microscope that they’ve obviously had to save up for. (Peter Parker is the sort of young man who has “always wanted” a particular piece of scientific apparatus.) The final panel on page 8, while rather corny, is incredibly cool: a grinning Parker playing with his new toy, with two happy old people behind him. Stan Lee piles on the irony “They’re the only ones who have ever been kind to me!” Not true, by the way. 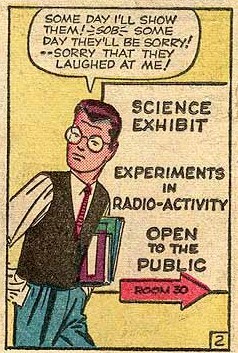 His science teacher is friendly and encouraging. “I’ll see to it that THEY’RE always happy.” But of course, because of what he’s just done, that’s the exact thing he won’t do. That happy scene with the microscope is the last time we will ever see Uncle Ben. Peter comes home from a TV show and is told that Ben Parker has been murdered. 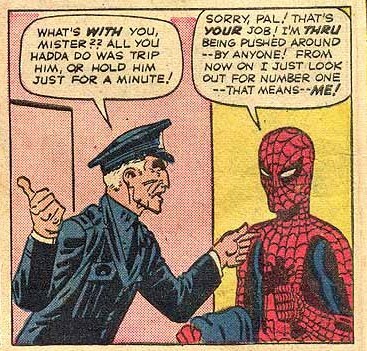 We don’t need to worry very much about the officer who breaks the bad news to Peter Parker being the same one who called out to Spider-Man at the TV studio -- and the same one who makes the arrest at the warehouse, come to that. (Later exegesis even made up a name for him: Baxter Bigelow.) I am sure that in real life it’s different cops who investigate domestic burglaries and deal with armed siege situations. But Ditko thinks in terms of character types: so the “nice policeman” has white hair and a mustache regardless of what context you meet him in. Ditko is a cartoonist. He tells stories in pictures: Lee’s words are often superfluous and occasionally miss the point. Peter Parker carries a pile of books to indicate that he is a bookworm. Spider-Man has a coat over his arm to show that he is just leaving. Rich people have cigars; you can generally tell if someone is a wrong‘un by their hat. You can tell precisely what is happening in the final scene simply by looking at the pictures; they are as perfect a piece of visual story telling as has ever been committed to newsprint. *Parker puts on his costume. *Spider-Man runs up the wall (leaving his bedroom window open). *Spider-Man squirts some web at a flagpole. *Spider-Man swings over the docks. *The burglar looks out of the window (with his back to us). *The burglar (who still has his back to us) looks up at Spider-Man. *Spider-Man looks down at the burglar (who has covered his face with his hand). *The burglar runs away (covering his face with his hand). *Spider-Man faces the burglar; Spider-Man has his back to us; the burglar’s face is in shadow. *Spider-Man webs the burglar’s gun; the burglar covers his face. *Spider-Man punches the burglar, knocking his hat off. *Spider-Man holds the unconscious burglar and see his face…and it’s the face of the thief he wouldn’t help the old cop catch on his first night as a TV star. This scene, more than any other, defines Spider-Man. It’s been retold over and over again, in two different movies, in cartoons and in multiple comic books. Spider-Man failed to stop the criminal who subsequently killed his Uncle and learned that in this world with great power there must also come great responsibility. To answer that question, we need to get slightly ahead of ourselves. Amazing Spider-Man #1, though published 6 months later, follows on directly from Amazing Fantasy #15, and is written and drawn in a similar style. On my view, it was intended to appear in Amazing Fantasy #16 and contains three more chapters which make up all we have of Ditko’s original graphic novel. In the original text, what does Spider-Man do straight after learning that he caused, or at any rate failed to prevent, the death of his beloved Uncle Ben? According to Amazing Spider-Man #1 he has a temper tantrum, throws his costume on the floor, and considers giving up being Spider-Man. The second thing he does is contemplate turning to crime to raise some money: Aunt May is on the point of being turned out of her house by her cigar chomping capitalist landlord. The third thing he does is go back to his agent, and resume his TV career. There is absolutely no sense that the death of Uncle Ben has motivated him to become a crime fighter, or even to live his life more generously from now on. Spider-Man is defeated by Doctor Octopus and considers giving up being Spider-Man. Uncle Ben is not mentioned: Spider-Man is turned around by a motivational speech from the Human Torch. In issue # 18, he is again ready to quit, but changes his mind when he sees how much gumption and determination Aunt May still has. When Uncle Ben’s death is mentioned, it’s significance is down-played. In Spider-Man #1, Ben died because Peter was too late to save him; because he was showing off on TV when their house was burgled. In Spider-Man Annual #1, he is “partially to blame for Uncle Ben’s death” (which is a fair distance from “all my fault!”) and says that he let the thief escape because he didn’t want to waste his powers. In Spider-Man #33 he talks about “failing” Uncle Ben and “blaming himself” for what happened. If we were interested in psychoanalyzing fictitious characters, we might say that Peter repressed his memories of what happened on that terrible night. Presumably, it all comes back to him when he sees the security guard who resembles Ben Parker in issue #50. But that's way in the future. The idea that “the one person I could have stopped but didn’t killed the one person I most cared about in the world” is very much the kind of O’Henry ending you'd have expected in Amazing Fantasy — not too far removed from “the man who warned us about the shapeshifting aliens is actually a shapeshifting alien with amnesia.” (I recall a post-Dahl episode of Tales of the Unexpected in which a sailor kills a man in a knife fight. An old flame directs him to a powerful gangster who owes her a favour and will get him out of town safely -- but it turns out that earlier in the day the gangster was killed...in a knife fight.) In one sense, it's meaningless. It’s true that if Peter Parker had stopped the burglar, the burglar could not have killed Uncle Ben, but thousands of us random events conspired to bring the burglar to that particular house on that particular day. (What was he stealing, by the way, if they are so poor they can hardly pay their rent? Microscopes?) It’s true, but it’s not usefully true. In the evil we have done, and in the good we have not done. In this world, with great power there must also come...great responsibility. This is a socialist message: the very opposite of what Steve Ditko himself believed. Ditko was and is an objectivist. He thought honest self-interest was the only way forward; that looking after number one and not catching crooks unless you were a paid crook catcher was the only sane way to behave. Does this mean that the Uncle Ben motif originated with Stan Lee? If so, does it follow that Stan Lee must have given Ditko quite a detailed plot summary (much more than “what if a teenaged boy found he could stick to walls”); and that Steve Ditko, at that point in their relationship, was prepared to faithfully and brilliantly render story lines that weren’t to his personal taste? By Stan Lee’s own account, Steve Ditko very rapidly became the driving creative force behind Amazing Spider-Man, creating plot-lines which Stan Lee had no input into. 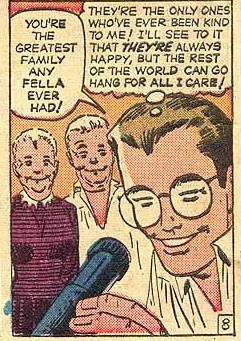 So we might imagine that while conservative Ditko controlled the book, the tragedy of Uncle Ben was quietly forgotten. But once liberal Stan Lee became the dominant force (in 1966) he lost no time in putting Ben Parker back at the center of his nephew’s psyche. Amazing Fantasy #15 doesn’t contain, even in embryonic form, any of the things which made Spider-Man so great. There’s no Jameson, no action, no aerial acrobatics, no romantic misunderstandings, no super-villains and no jokes. All that it contains of the future Spider-Man was Stan Lee's name, and Ditko’s insane, iconic, un-improvable costume design. Perhaps, as a point of origin, that was enough. Please support this project on Patreon. "His favourite food is wheatcakes." Woah, there! His favourite breakfast is wheatcakes. The canon does not tell us (at least not in this issue) his overall favourite food is. Smart-alec comments aside -- I am loving this series. Truly fascinating. I re-read the two relevant episodes before your post, and was struck anew by how strange it is that these two men just wrote Spider-Man, out of nothing, with no pre-existing Spider-Man mythos to lean on. I am -- truly -- touched that you'd be interested in my thoughts. I'd love to do this, but right now is the worst possible time. I am over-committed in three different directions simultaneously. Perhaps in a few months it will become a non-insane thing for me to do. But by then, your own much better-informed thoughts will be out there.